Astoria Investor Forum-2016 was organized on December 7-8 2017. There will be a post conference report released soon. 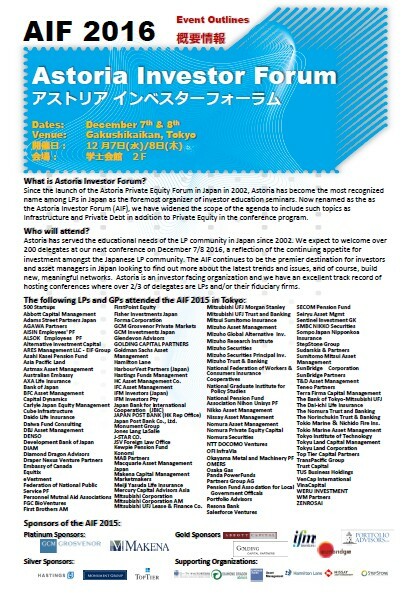 Since 2002 Astoria has become the most recognized name among LPs in Japan as the foremost organizer of investor education seminars. Now renamed as the as the Astoria Investor Forum (AIF), we have widened the scope of the agenda to include such topics as Infrastructure and Private Debt in addition to Private Equity in the conference program. Astoria has served the educational needs of the LP community in Japan since 2002. We expect over 200 delegates at the next conference, which is a true reflection of the continuing appetite for investment amongst the Japanese LPs. 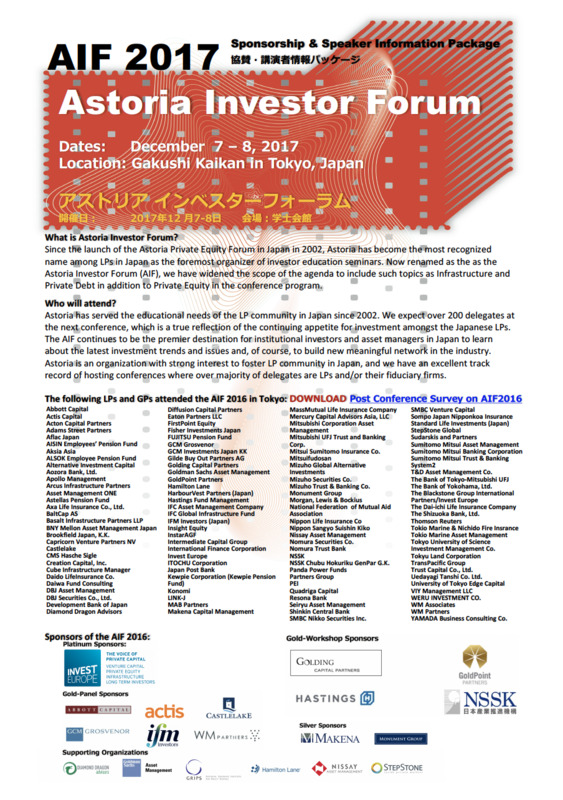 The AIF continues to be the premier destination for institutional investors and asset managers in Japan to learn about the latest investment trends and issues and, of course, to build new meaningful network in the industry. Astoria is an organization with strong interest to foster LP community in Japan, and we have an excellent track record of hosting conferences where over majority of delegates are LPs and/or their fiduciary firms. Astoria Investor Forum-2016 was successfully concluded on December 7-8, 2016. Over 200 participants with majority of attendants were representatives of institutional investors from Japan participated in this conference. Copyright ©2017 Astoria Consulting Group LLC. All rights reserved.